What if apps didn’t need a display to send you messages? Or what if you could talk to someone across the room without raising your voice? 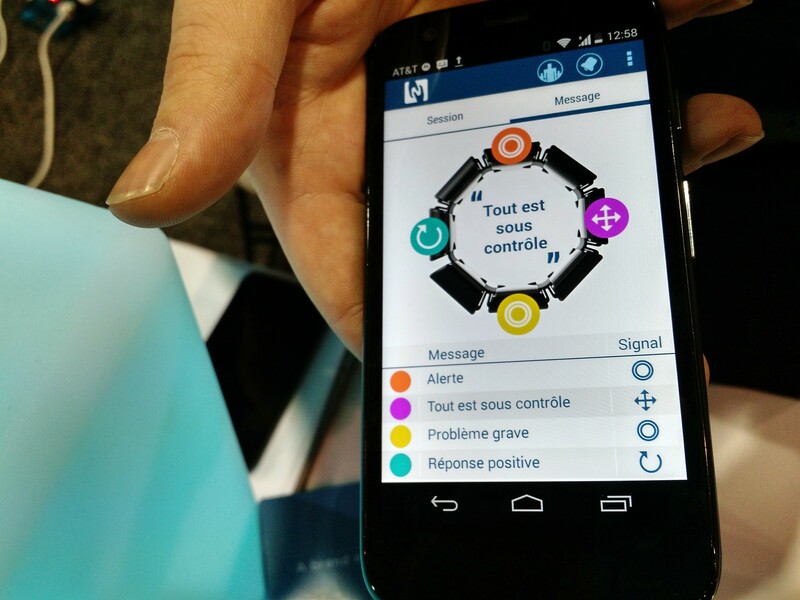 French wearable startup Novitact wants to solve these problems with its Feeltact bracelet, which the company showed off at CES in Las Vegas this week. Feeltact is a bracelet that includes four buttons to send and respond to information, as well as multiple small cells that are capable of vibrating in a variety of patterns. The bracelet is connected to your phone via Bluetooth LE, and a dedicated app can be used to define what different patterns of vibrations mean. Novitact CEO Thibaud Severeni demonstrated the bracelet to me Thursday at CES by using the company’s own mobile app, which is capable of translating pre-determined alerts and text messages into vibration patterns, but the company also wants to release an SDK to let third-party app developers access the Feeltact bracelet. The bracelet is currently available for pre-order, and Severeni said that it may cost as much as €250 (almost $300). That’s a steep price, but I nonetheless like the idea behind Feeltact. Non-visual mobile communication seems to make a whole lot of sense for wearables, many of which either have very small or no displays at all. Not every piece of information warrants a glance. Tactile feedback may be less distracting, and possibly even more immediate than a message that gets lost among too many notifications on your screen. Of course, Apple is also exploring this idea with its watch. The company has said that Apple watch users will be able to send subtle vibration pulses to a loved one who is also wearing the watch to let them know that you are thinking of them. Severeni told me that his company is aiming for much more complex interactions through the sense of touch, but it may be hard for the company to compete with big guys like Apple, Samsung and LG. That’s why Novitact is also thinking about licensing its technology to manufacturers of smartwatches and other wearables.